World Archeology: 6,000-year-old crown found in Dead Sea cave revealed. 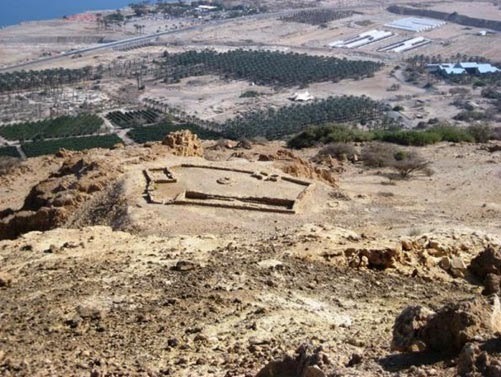 6,000-year-old crown found in Dead Sea cave revealed. The world’s oldest crown, which was famously discovered in 1961 as part of the Nahal Mishar Hoard, along with numerous other treasured artefacts, are to be revealed in New York University's Institute for the Study of the Ancient World as part of the 'Masters of Fire: Copper Age Art from Israel' exhibit. The ancient crown dates back to the Copper Age between 4000–3500 BC, and is just one out of more than 400 artefacts that were recovered in a cave in the Judean Desert near the Dead Sea more than half a century ago. 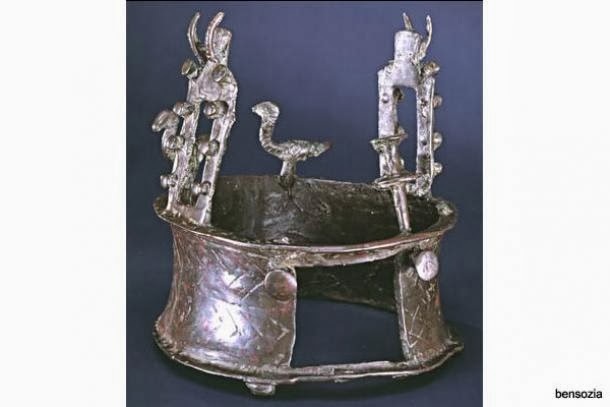 The crown is shaped like a thick ring and features vultures and doors protruding from the top. It is believed that it played a part in burial ceremonies for people of importance at the time. New York University writes: “An object of enormous power and prestige, the blackened, raggedly cast copper crown from the Nahal Mishmar Hoard greets the visitor to Masters of Fire. The enigmatic protuberances along its rim of vultures and building façades with squarish apertures, and its cylindrical shape, suggest links to the burial practices of the time.” The Nahal Mishmar Hoard was found by archaeologist Pessah Bar-Adon hidden in a natural crevice and wrapped in a straw mat in a cave on the northern side of Nahal Mishmar, which became known as the ‘Cave of Treasures’. 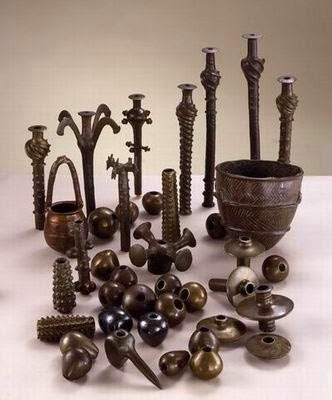 The 442 prized artefacts made from copper, bronze, ivory, and stone include 240 mace heads, 100 sceptres, 5 crowns, powder horns, tools and weapons. Some of the items from the Nahal Mishmar Hoard. Photo source. Carbon-14 dating of the reed mat in which the objects were wrapped suggests that it dates to at least 3500 B.C. It was in this period that the use of copper became widespread throughout the Levant, attesting to considerable technological developments that parallel major social advances in the region. Some of these objects are like nothing ever seen anywhere else. The round knobs are usually said to be mace heads, but there is no evidence that any of them was ever used in combat. The remaining objects are even more unusual and unique in style, such as the bronze sceptre depicted below. 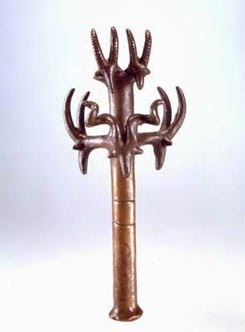 Bronze sceptre from the Nahal Mishmar Hoard. Displayed at the Hecht Museum in Haifa. Photo source. The objects in the Nahal Mishmar hoard appear to have been hurriedly collected, leading to the suggestions that the artefacts were the sacred treasures belonging to the abandoned Chalcolithic Temple of Ein Gedi, some twelve kilometres away, which may have been hidden in the cave during a time of emergency. The purpose and origin of the hoard remains a mystery. Featured image: The oldest crown in the world, found in the Nahal Mishmar Hoard. Photo source.